Learning the American Sign Language (ASL) now becomes easier and enjoyable with ASL for iPad from Zoosware. You can easily at your own pace do a revision of the American Sign Language. 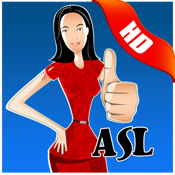 ASL for iPad allows you to review the American Sign Language vocabulary. Each sign language vocabulary has its own descriptions and memory aid which can be used for review. The search feature can also be used to quickly look up for an ASL word. Post your achievement to Facebook and share with your friends which ASL words you've learned today. You can always have an enjoyable time while learning the ASL on your iPad. Learning the American Sign Language (ASL) would now becomes easier with these software from Zooware. No matter where you are, you can slowly and gradually familiarise with the vocabulary of the ASL. Upgrade to Pro version using the in-app purchase at US$4.99 and you'll get to view 1400 ASL words.